Do you live or work in a floodplain? Flood hazard maps help determine the flood risk to your home or business. The Department of Ecology highly recommends contacting the community Floodplain Administrator, Community Development Director, or Public Works Department for specific flood risks and regulations. FIRMs outline flood hazards in a community. A FIRM may include flood insurance risk zones, 1% and 0.2% annual chance floodplains, floodways, base flood elevations or depths, roads, streams, and more. They are developed by FEMA. DFIRM database product: Digital FIRM. These are gradually being updated by county. Digital Q3 flood data product: The current FIRM if there is no DFIRM for a county. 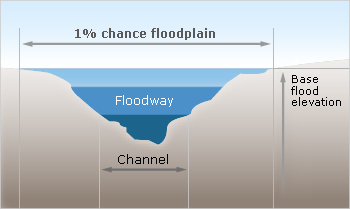 Stream channel, plus floodplain areas, that must be kept free from building so the 1% annual chance of flood can occur without increasing flood heights. 1% annual chance of flooding may be equaled or exceeded in any given year (100 year flood). These areas are subject to high velocity wave action (a 3-foot breaking wave) from the 1% annual chance coastal flood. High-risk zones are areas that have a 1% chance of flooding each year. If you live in a Special Flood Hazard Area or high-risk area and have a Federally-backed mortgage, your mortgage lender requires you to have flood insurance.